The survey and the report are part of our ongoing effort to assess state role of virtual conferences, trade shows, and similar events in the broader events market. This work builds off three previous reports, the most recent of which is still available for download. What features and functionalities are most common in virtual events? 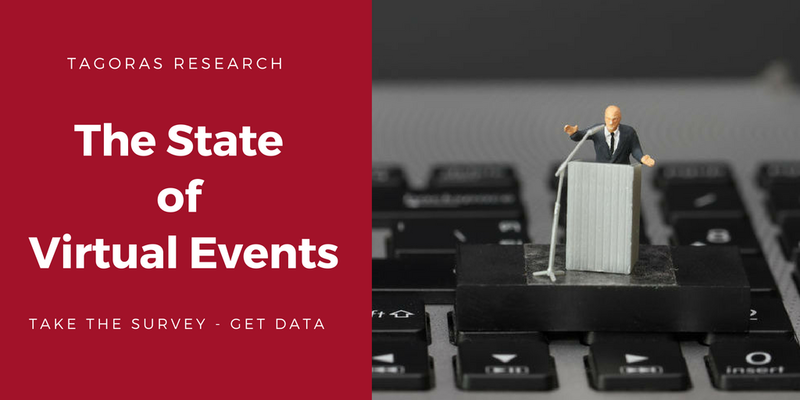 How do attendance and revenue from virtual events compare to similar place-based events? How are organizations evaluating their virtual events and measuring learning? How satisfied are organizations with their virtual events? While in the past we have focused solely on trade and professional association use of virtual conference, we are now expanding our efforts to include any businesses – commercial or nonprofit. So, no matter what type of organization or company you represent, and no matter how large or small, if conferences and other events are a part of your offerings, we’d really like to know what you are (or are not ) doing with virtual events. It should take no more than 10 minutes to complete, and, depending on your answers, may take only a couple of minutes. Share this blog post on Twitter, LinkedIn, Facebook, or your own blog, or otherwise point your audience to the survey at https://www.surveymonkey.com/r/6SSV988. Anyone who completes the survey can register to be entered in a drawing for one of five Amazon gift cards worth $50 that we will give away to five randomly selected survey participants.